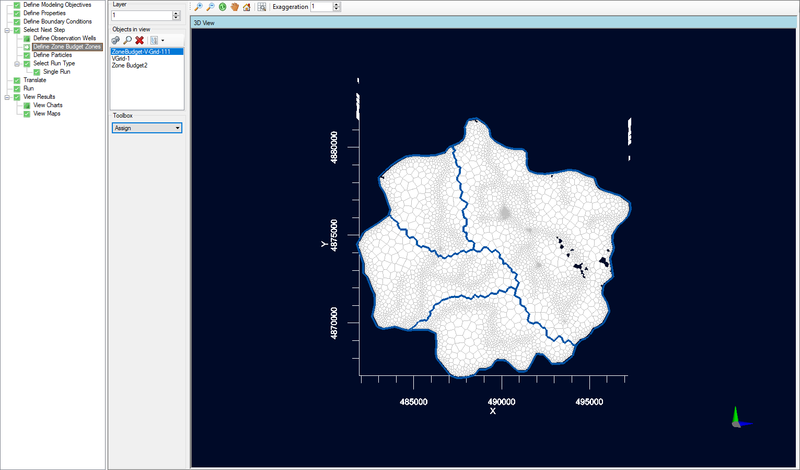 ZoneBudget is a USGS program for computing subregional water budgets for MODFLOW ground-water flow models. Within Visual MODFLOW Flex, you can create new zones for MODFLOW-2000 and -2005 models in the numerical model workflows. 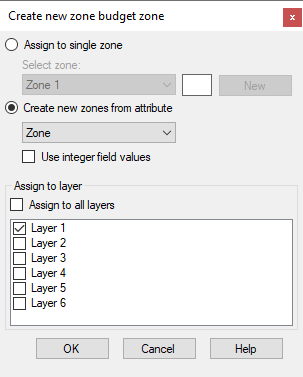 If you imported a Visual MODFLOW Classic model, you can also view the zone budget zones that were defined in this numerical model. 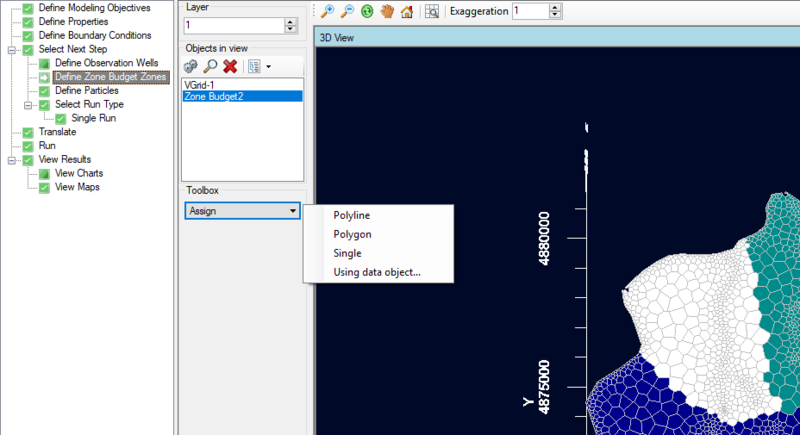 At the Define Zone Budget Zones step, you can create new zone budget zones by digitizing new zones using Assign Polyline, Polygon, or Point (Single Cell), or by using 2D/3D point, polyline, or polygon shape objects from the Data tree. •Click the New button to assign the selected cells to a New zone; otherwise, you can select to assign cells to an existing zone by selecting the zone from the dropdown list at the top. 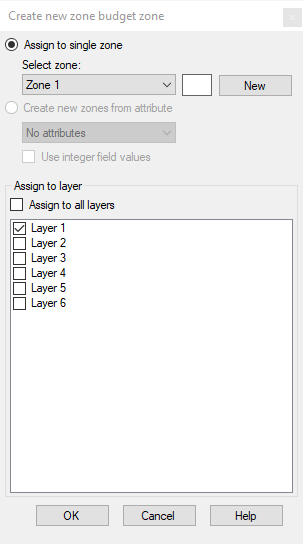 The selected cells can be assigned to the current layer or multiple layers using the check boxes at the bottom of the window. Once you are finished, click OK.
•Digitize one or more polygons, and repeat the steps as described above for Polylines. •Left-click on one or more cells and a point will appear. Once finished, right-click and select "Define Attributes", and follow the steps as described above for Polylines. •The following window will appear. •Choose the desired point, polyline, or polygon data object from the tree. A simple example is shown below for a polygon data object (shown in red). 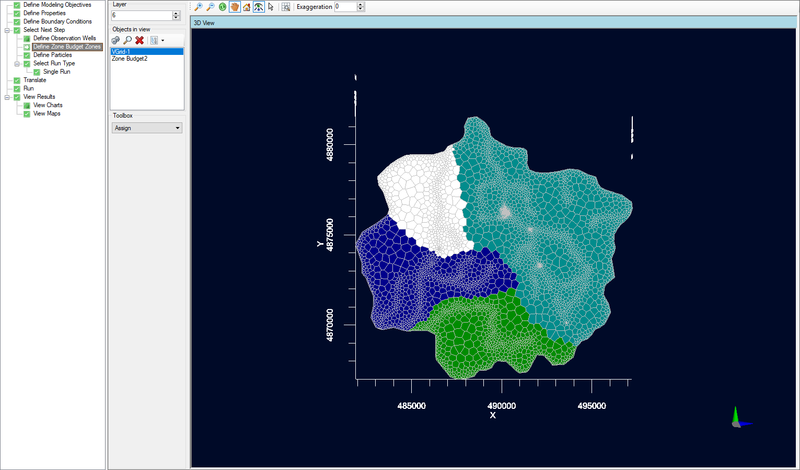 After the zones are generated, they will appear in layer view. When the selected shape contains multiple polyline or polygon features, then a new zone will be created for each feature.